Well I got through half of the lab tonight I got a slow start tonight as our main database at work came to a screeching halt after chewing up massive amounts of drive space. After we got that working I was pretty flustered, but able to get started. One valuable lesson I learned tonight after doing my first rack time: always power cycle the rack when first getting access to it. I didn’t do this and was stuck on a configuration for ether channel until I realized there was some rogue commands running. I power cycled the rack and redid my configurations and the ether channel finally came up. I was on Rack 12 over at IE, but some of the lab scenarios in the workbook didn’t match their hardware. Switch1 wasn’t connected to Router6 as in the workbook so I had to move past some routing on a stick and so forth. Working on some ether channel configurations though really helped in understanding the material better. Hopefully I can complete the switching lab and move on to the rest with Dynamips. Well I got through all my readings, but a lot of the new material such as Multicast and QOS is still very fuzzy. I am going to start going through IE’s lab book I tonight starting with switch material. Internetwork’s lab book I is broken down by subjects. This way you can concentrate of each section while you go through the configurations. I am thinking I really need to go through some hands on with the QOS and Multicast to really get a good grasp of it before taking the written. No reason not to build the solid foundation now. I got a little bored trying to read over the whole OSPF chapter tonight and decided to open up some of the BSCI 3.0 stuff I had laying around. 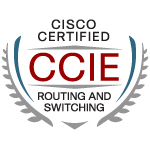 It helped give me a good refresh of all the OSPF material. Odom’s guide seems to be just a quick review (which it very well is probably supposed to be.) I have all the material to do for my Internetwork Expert class on demand, but wanted to save those for the lab prep. I want to at least do the full 80 hours twice and would rather not be bored it it by doing it three times.